This car phone mount is universal phone holder for cell phone within 5.5". 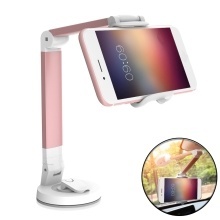 Easy to installation and use compact solid stable design with 360 degrees rotation, it allows infinite viewing angles for your phones. Flexible 360° swivel ball-joint and 180° regulate hand arm provides infinite viewing angles. Elastic clamping arm can hold 5.5" devices max. Made of strong materials, solid and sturdy with high durability. Non-slip silicone pads in clip protect your phone from scratches. Secure suction pad sticks tightly on the dashboard or most surfaces. Can also be used in bathroom,bedroom and office any smooth surface. Lightweight and small size, compact, can be easily fit into rucksack or bag.